The following is a collection of useful tools to help guide you in your collaboration with your partner. Source: Guth, S. (2013). The COIL Institute for Globally Networked Learning in the Humanities Final Report, pp. 10-17. Additional resource: Bethke, R. (2016). New tech to revolutionize studying abroad education. eCampus News. "Opening remarks and model analysis": Launch the connection by gathering students in a video-conferencing room where instructors can offer opening remarks to students at different geo-locations. Explain the purpose and objectives of this virtual collaboration, and undertake a model analysis to prepare students for student interactions and working in small groups. "Small group ice-breakers": Engage students in ice-breaker activities in small groups. Examples of ice-breaker activities include browsing through each institution’s websites and discussing findings, and sharing and discussing cultural artifacts and their significance. The purpose of the ice-breaker activities is two-fold: 1) to provide an opportunity for students to get to know one another and form relationships, and 2) to enable students to become familiar with the technology and process of virtual collaboration. "Small group analysis": Working in small groups, students are assigned an activity pertaining to rhetorical studies, such as analysing websites, advertisements and videos. The purpose of this interactive activity is to help foster the intercultural exchange of views and perspectives. "Collaborative production": As one of the major assignments in this curriculum, students are asked to work cooperatively in small groups to develop a product that is reflective of their learning experiences during this virtual collaboration. Examples of assignments include: preparation of a presentation script, development of a multimedia text (e.g. blog, website). Students will then have an opportunity to share these products with other groups. Through this group assignment, students can learn and refine ways to collaborate and communicate with others across different cultures. "Group presentation": Organize another video-conference meeting, as technology permits, and gather students for presentations about their assignments. If the technology is available, there might be opportunities for other groups to submit comments through the chat box to provide real-time responses, reactions, and feedback. 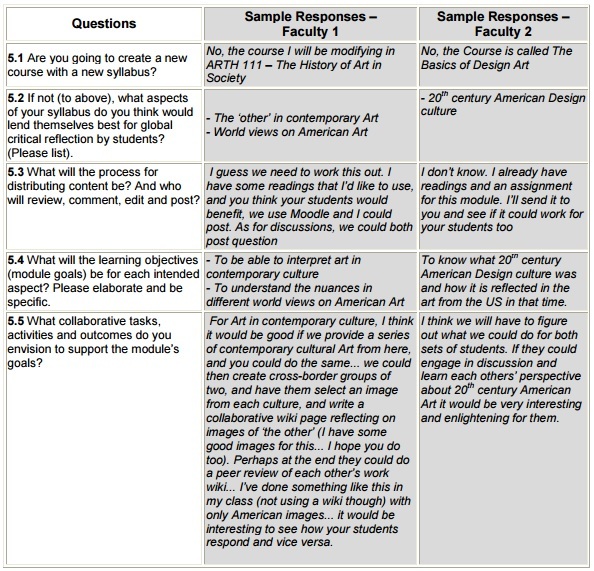 "Reflection": After every CCR virtual collaboration, students are asked to provide feedback on their experiences on the CCR blog. Instructors may also decide to hold a collective debriefing session to discuss the experience, or instructors may ask students to complete an exit survey which will help in the assessment of the virtual collaboration. This component is a critical part of the Stanford CCR Project in promoting intercultural competence. Adapted from O’Brien, A. J. (2011). Global citizenship and the Stanford Cross-Cultural Rhetoric Project. Journal of the NUS Teaching Academy, 1(1), 32–43. Additional resource: Courant Rife, M. (2010). Cross-Cultural Collisions in Cyberspace: case studies of international legal issues for educators working in globally networked learning environments. E-Learning and Digital Media, 7(2), 147. 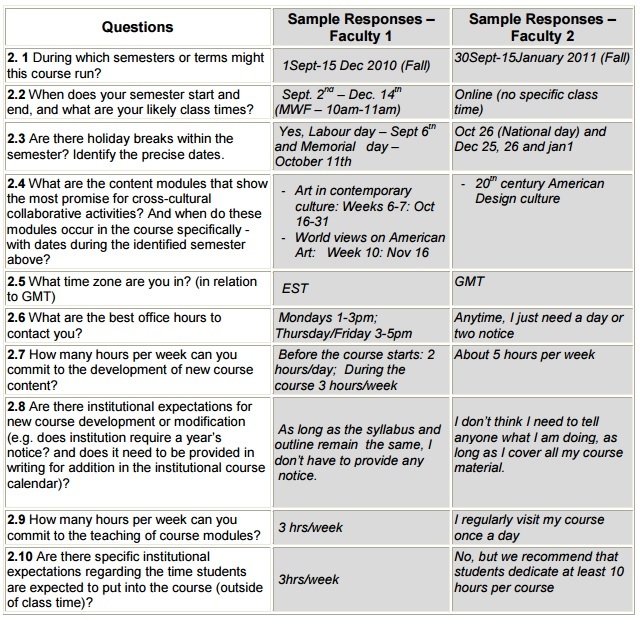 Chandra and colleagues have developed an online International Cross-Cultural Experiential Learning Evaluation Toolkit. Their website provides access to assessment rubrics focusing on cross-cultural learning outcomes among students, activity guides for educators, and more. Source: International Cross-Cultural Experiential Learning Evaluation Toolkit (2015). Assessment Rubric. The British Council's Connecting Classrooms in East Asia: Monitoring & Evaluation Toolkit (2010) presents a useful guide for conducting evaluations amongst different stakeholders. The toolkit presents adaptable models of comparative surveys for students and teachers to measure the success of fostering global competencies in the classroom before and after the intervention. Additionally, the toolkit offers guidance on conducting interviews to qualitatively study the impacts of the project or activities on students and institution. For more, see British Council. (2010). Connecting Classrooms in East Asia: Monitoring & Evaluation Toolkit. York University's Globally Networked Learning (GNL) website provides an evaluation guide for faculty developing an exit survey after students have completed a GNL course or assignment. The evaluation guide is available as Word document here. Source: York University. Globally Networked Learning: Intercultural Learning Module for Use in your Classroom.